You know it’s a slow time of year for new releases when the only new arrival in the chart is a movie tie-in. That game? Little Orbits’ How to Train Your Dragon 2 at a lowly #34. It’s Watch_Dogs that’s the UK’s number one, knocking Sniper Elite 3 down to #2. This’ll be the 4th week that Ubisoft’s crime caper has taken the top spot. FIFA 14 remains at #3, Wolfenstein: The New Order moves up to #4 and then at #5 it’s Titanfall. As we suggested last week, 3DS curio Tomodachi Life has managed to penetrate the top 10. Nintendo’s promotions – including a buy one download get one half price deal at GAME – have paid off, with the game now at #9. Fellow Nintendo title Mario Kart 8 is now at #16, incidentally. Wii Sports Club – last week’s only retail release – has failed to make the top 40. Not only this, but it also failed to make the Wii U top ten. Presumably those who wanted to play Wii Sports in HD have already made a purchase via the eShop. Those who never played Sniper Elite V2 may be under the impression that it was just another shooter. In reality, that couldn’t be further from the truth. As well as an X-ray kill cam, showcasing the entry and exit of every bullet in grizzly detail, it was also vital to both plan ahead and cover your tracks. The thinking man’s third-person shooter, it rewarded patience like no other. With a relatively short 18 month turnaround, Sniper Elite 3 does bare quite a resemblance to its predecessor. Of the two though, this is the far superior game. The sniping mechanics have been honed and tinkered with and the environments are now larger and more open. The fact that there are only eight missions shouldn’t cause concern, as each takes a good two or three hours to bring to a close. They’ve been designed with replay value in mind too, frequently taking the focus away from sniping with optional side missions such as destroying ammo dumps and locating weapon blueprints. Set in 1942, the war-torn city streets have been left behind in favour of dusty African plains. That means plenty of sun, sea and sand. Well, maybe not that second one. After the brief, explosion heavy, tutorial mission is out of the way the first main mission – centred around a large oasis – does a superb job of drawing you in. Due to the sheer size of the environments, almost every objective can be reached in numerous ways. As such, this is a game that both encourages and rewards exploration. Stray from the beaten path and you may come across a sniper nest, or a supply of invaluable explosives. Trip wires and landmines can be placed for enemies to blindly walk into, while starting a small fire on top of a block of dynamite, and then observing enemies cautiously approach, is another constant source of amusement. Rocks can also be thrown to cause a distraction, giving the chance to sneak behind enemies to perform a stealth kill. The loadout screen gives the chance to take as many explosives into battle as you deem necessary. Weapon upgrades, incidentally, are not simply found lying around but are instead carried by certain enemies. Using binoculars to tag foes can reveal if somebody is carrying something of use, as well as assist in keeping track of their location. Last week was uneventful for new releases and as such this week’s UK chart is a dull one. 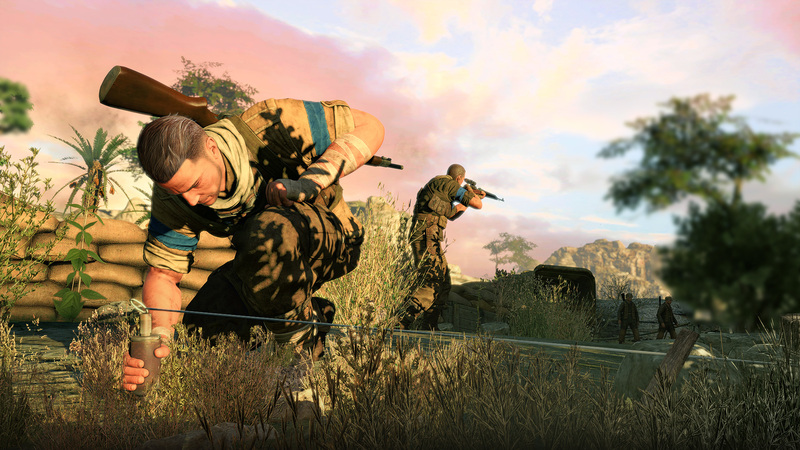 Sniper Elite 3 is the UK’s number one for a second week running while Watch_Dogs remains at #2. FIFA 14 rises up from #6 to #3. Titanfall holds onto #4 and then at #5 it’s Wolfenstien: The New Order. Presumably due to price-cuts, 2014 FIFA World Cup Brazil re-enters the top ten, up from #11 to #8. Mario Kart 8 is back on the rise too, if only from #13 to #12. Tomodachi Life has likewise seen a boost, going to #16 to #11. Will it manage to break the top ten? With various promotions around, it may well do so in the coming weeks. Last week’s new arrivals – GRID Autosport and Transformers: Rise of the Dark Spark – are already on the descent. Codemaster’s latest racer drops all the way from #7 to #16 while Activision’s transforming robots go from #12 to #18. It’s a quiet week in the individual format charts too, aside the noteworthy arrival of Child of Light at #1 in the PS Vita chart. Proving that shooters are still as popular as ever, 505 Games’ Sniper Elite 3 has taken the top spot of the UK chart. The fact that the last-gen versions are available for around £25 likely played a key part in helping it get there. Watch_Dogs remains at #2 while EA Sports UFC – last week’s number one – drops to #3. At #4 and #5 respectively, Titanfall and Wolfenstien: The New Order round off the UK top five. Codemaster’s well-received GRID Autosport is the next highest new entry at #7. Other new arrivals include the mediocre Transformers: Rise of the Dark Spark at #12 and One Piece: Unlimited World Red at #28. The anime tie-in also enters both the PS Vita and Wii U charts. Also of note is Mario Kart 8 leaving the top ten in the UK top 40 this week, falling from #7 to #13. 2014 FIFA World Cup Brazil departs too, now sitting on the bench at #11. Over in the single format charts meanwhile we spy Dynasty Warriors: Gundam Reborn enter at #12 in the PlayStation 3 chart and How to Train Your Dragon 2 make #9 in the 3DS chart. To allow plenty of reviews of the week’s new releases to materialise, we always wait until towards the end of the week to compile our weekly round-up. This week however we’re still waiting on reviews for two major releases – Transformers: Rise of the Dark Spark and Sniper Elite 3. Rise of the Dark Spark developers Edge of Reality have been around since 1998, and have worked mostly on conversions and licensed games. 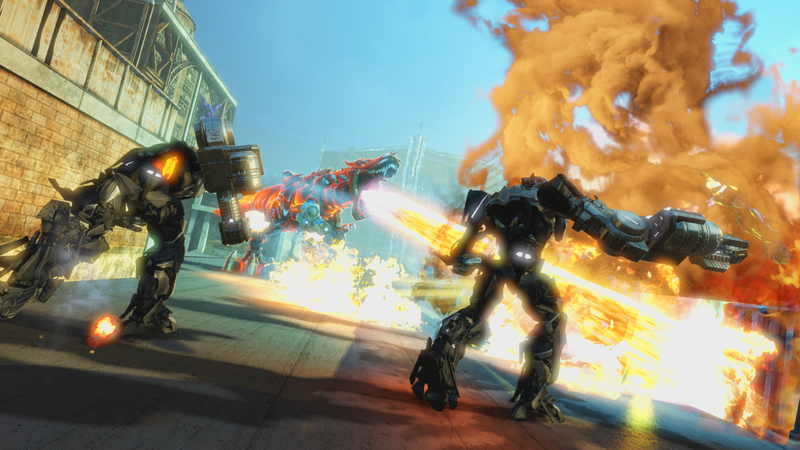 We’re still unsure as to why Activision didn’t let High Moon Studios carry on their good work, but on the grounds of Edge of Reality’s experience we’re mildly confident that this latest Transformer endeavour will be ‘good’ at the very least. Don’t expect the PlayStation 4 and Xbox One versions to be leaps and bounds over their last-gen counterparts though – word has it that the differences between last-gen and next-gen versions are barely noticeable. The 3DS version, incidentally, is a strategic RPG developed by WayForward. Although an alluring proposition, we’re worried that it’ll veer on the casual side of things. You can however bet your last Energon cube that it’ll feature some tidy sprite work, if nothing else. As much as we enjoyed Sniper Elite V2 – once referring to it as “the thinking man’s third-person shooter” – we’re slightly apprehensive about Sniper Elite 3. As to why the review embargo isn’t being lifted until the last minute is one reason; the fact that it’s a mere £25 on PS3 and Xbox 360 is another. Could the cheap price tag be compensating for something, such as the game’s length? Perhaps, although the PS4 and Xbox One versions are set to retail at around £40. With a bit of luck, reviews will be knocking around by the time you read this. 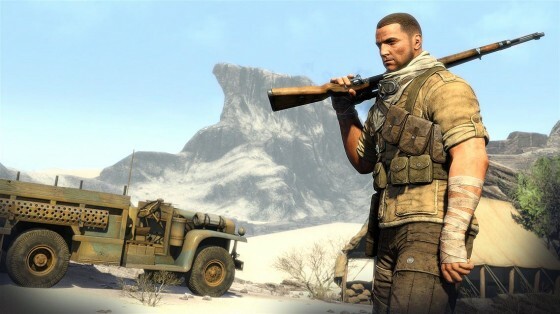 We highly doubt that Rebellion are about to release a steamer, in all honesty – Sniper Elite is their flagship franchise. 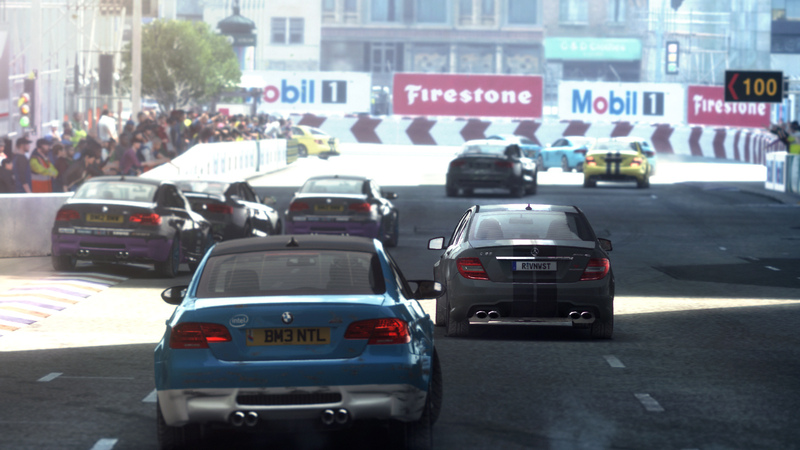 GRID: Autosport is one that we can recommend, thanks to the positive reviews that appeared earlier this week. Eurogamer said that “Grid Autosport is a fine racing game, though it’s never a thoroughbred one” before handing out a respectable enough 7/10, while God is a Geek enjoyed it a touch more, giving it an 8/10. “Even if your interest in cars is merely fleeting, GRID Autosport juggles realism and aggressive satisfaction to deliver an intoxicating mix somewhere between the joy of an arcade racer and the science of a true sim” they said. Codemaster’s latest racer is available on PS3, Xbox 360 and PC. There are no next-gen versions – Codemasters wants their next-gen racing début to be something truly special.